I was reading Elle August issue on the bus from New York City, and I saw an ad about Maybelline Great Lash Mascara as America's favorite mascara. I am sure that everyone knows how popular Great Lash Mascara is, and I have constantly seen Great Lash Mascara win numerous beauty awards over the years. However, I never knew that "one is sold every 1.7 seconds! " Wow, it is a solid fact with a winning record! Are you a Great Lash fan? Would you never leave home without your Great Lash? Let me know what you think. that mascara has been sold because of SO MUCH HYPE. it's totally UNDERwhelming to me, just meh. I really like the royal blue version of it though, fun and bright. The regular stuff though? completely benefited from overhype in my opinion. Covergirl Lash Blast and pretty much any other mascara is better to me, lol. The maybelline lash stylist mascara was WAY better and shouldn't have been discontinued. Overhyped! I've tried great lash a while ago, but I could not find anything spectacular about it. I did not like the brush nor the formulae of it. 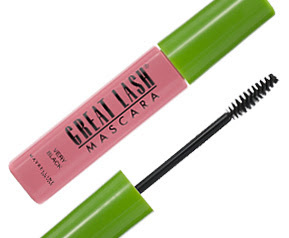 But then again, we can't deny the fact that Great Lash has won countless of award for drugstore mascaras. I think Great Lash is very overrated. Almost every other brand I've tried is better. Hey I haven't tried it as yet.I use Revlon or Loreal mascara. when I was a teen I used to have it. It was good and cheap;-) And I love the combination of green and pink! But I haven't used it for a long time. Now I have Other must haves.